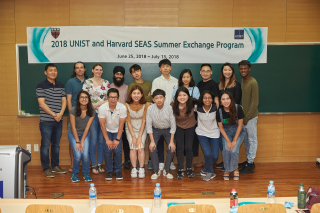 The UNIST-Harvard SEAS Summer Program is scheduled to be held from July 6th to 13th on UNIST campus. This is an international research internship program, which started from the summer of 2017. Every year, it brings together the best minds in science and technology from UNIST and Harvard School of Engineering and Applied Sciences. The primary goal is to foster a collaborative mindset and helping students develop a global perspective.